Tired of the same ol’ shoes? Needing to accessorize your outfit in a way that makes YOU stand out from the crowd? Then look no further then this guide, as you can put the “clip clop” back in to your clogs! 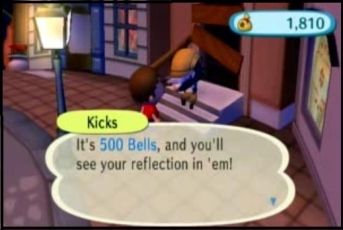 First, you will need to find Kicks, a cockney skunk that is willing to shine your shoes for a mere 500 bells! He is found 9 AM - 9 PM, on fair weathered/sunny days/cloudy days, between the Auction House and Shampoodle. As well, he only shines them once a day. If Kicks doesn't change your shoes, because they already match, there is no charge. When you talk to Kicks, the first choice is "Colours" this option will take into account the colours of your clothes and hair and the majority colour determines the colour of your shoes. More importance seems to be placed on hats and hair color, although shirts and accessories are considered too. There are so many different combinations and so it can be left to the imagination to figure what shoe colour is the right one for you! The second choice you have is “Match my Style”. This is when Kicks examines your appearance and shines your shoes to the style that fits in! The possibilities of type of shoe are endless and so far unpredictable. For example a character could be wearing the Green Zap suit and result in getting red shoes! This could be because the Zap suit is “Striking”. As with Shampoodle, the same applies to Kicks. After a couple of shoe shines, Kicks will ask you if you want your shoes to be Masculine or Feminine. 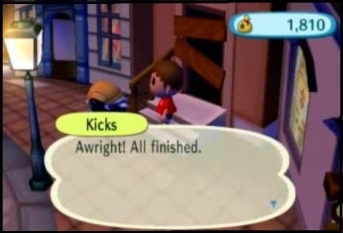 This means that if you're a boy you can get different colour shoes that you could only get if you were a girl character before. And vise versa if you're a girl. Now you're ready to show off your newly shined shoes to all of your friends!